This is one children's classic that I remember seeing on various summer reading lists as a child... and skipping. I don't know why exactly, but Egypt just didn't appeal to me. Now, I have filled this gap in my children's lit knowledge! April has moved in with her grandmother Caroline, after her mother in Hollywood has gone on tour. April is convinced she'll be rejoining her mother soon, but she does make friends with Melanie in Caroline's apartment building. April and Melanie, along with Melanie's little brother Marshall, find an abandoned backyard with a storage shed, behind an antique store, where they start to play their "Egypt game." Later they are joined by Elizabeth, another new neighbor in the building and eventually two boys, Ken and Toby. Making costumes and alters and rituals, the kids actually did a lot of research at the library for their game, and learned a lot without exactly realizing it. April comes to accept that she's going to stay with Caroline and this motley group of 6 multicultural children (African-American, white, Korean, Chinese) has a great deal of fun. Naturally, that can't be all to the story and there's a very scary climax which I saw coming from miles away. I don't necessarily think kids will find the foreshadowing quite as blatant as they'll likely be more engrossed in the other storylines. The characters are well drawn, especially April and Marshall, who by far have the most personality. I love the idea of a book showing kids how much fun simply using your imagination can be. And while the book was written in the '60s, I noticed nothing at all to date it, except perhaps a lack of cell phones, but I don't know if written today if cell phones would have come up in the story either, so it's very much a non-issue. The climax might be terrifying for particularly delicate and scaredy-cat kids, but otherwise I'd recommend it for all middle readers as a fun and exciting book. 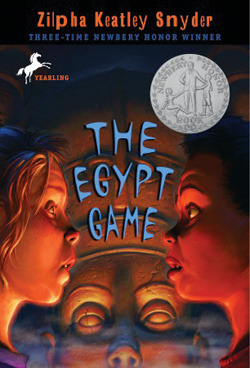 I ABSOLUTELY ADORE The Egypt Game... it is one of my favorite children's books! I've tried to prod my daugther into reading this...alas, I've not been succesful.